187/365(+1), a photo by Luca Rossini on Flickr. Every person in Tuscany is more or less secretly convinced to be living in the best town in the world, no matter how big or small it is. For the same reason, every person in Tuscany more or less secretly hates every other person that lives in any of the nearby towns. People here hate their neighbors because, by definition, the neighbors are all mistaken since they think to be living in the best place in the world. Now, what is great about people in Tuscany, is that they always turned this hate into (more or less) sane rivalry. In the old days of the Renaissance, when the region was the cultural hearth of the western world, they used to compete on architecture, art, and technology, an attitude which essentially boosted the whole cultural movement. Nowadays they compete mostly in food. Which, again, boosted most of the traditional-food industry of the country. And to promote their typical meals, towns throw food-festivals (sagra) every now and then. If you’re staying anywhere in Tuscany, you can bet there’s always a sagra somewhere near you. Just to make and example, right now there are at least six different food-festivals in a radius of 20km from our home. These festivals are great because they’re all about food and none about fuss. Meals are excellent, they’re usually cooked by the women of the town and served by their kids, so all the money goes to fund the services for the citizens. These festivals are usually held at the towns soccer fields, because the places are large, safe, and public. 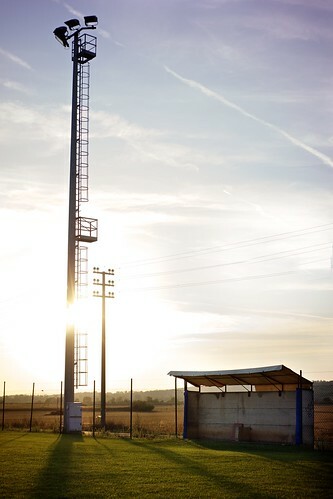 So, if you are driving along Tuscany at sunset and you pass by a large and empty soccer field, look better, you may spot a long line of people waiting to be served some excellent traditional food. If this is the case, you should stop, take a break, and enjoy the goods that the never-ending rivalry between the towns of Tuscany keeps gifting us with.